Buy your BISOL solar panels SPECTRUM BMU-270 at the best price exclusively online. BISOL BMU solar panels use polycrystalline cells. BISOL developed a special process technology to produce coloured cells. The colour does not affect their performance and duration. The warranty also stays the same. BISOL modules are made in Europe. All panels have a 10-year guarantee with a tolerance 0/+5 W. All the anti-corrosion and anti-salt tests were validated. 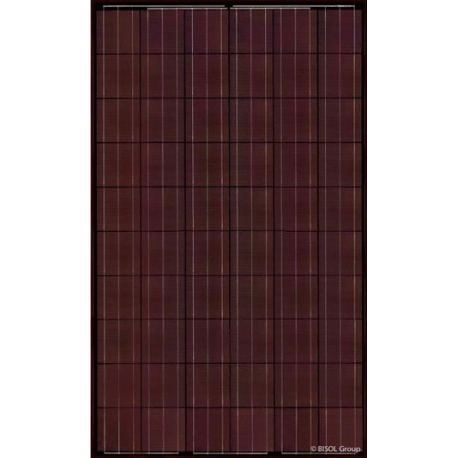 Linear performance guarantee: BISOL BMU-270 red solar panels cover the linear decrease. Every year, you can be assured that your BISOL panels display the expected performance curve.the reduction in the second year is only 0.5%. After 25 years, an output power of at least 85% is guaranteed. An innovative and secure solution. Coloured panels: BISOL BMU-270 red panels are ideal for your brick roof. Positive tolerance: BISOL BMU-270 red solar panels have a power range of 270 W to 275 W. Precious additional wattage to optimise the performance of your solar installation.